Time to try a more lighthearted approach. At its core, League of Legends seems to want nothing more than to come across as a polished, dignified, and grown-up sport that can sit alongside the traditional sports. It comes across clearly through the high production values, the besuited casters discussing games, and even the way that off-season madness is handled. As League continues to grow and evolve, it’s interesting to see the way we talk about roster changes. There are wild rumours about world champions heading to North American teams, fans clamouring to know how much SKT T1 paid for three-time world champion Faker’s contract, and Reddit wondering which young talents will end up on a LCS team. Riot Games have already started programs like the Scouting Grounds to reach out to young talent who are interested in playing pro. This is a great start, and it was a blast watching players, coaches, and candidates talking on Twitter about the endeavor. The Scouting Grounds and Challenger circuit are both ways to watch young players succeed, but there’s one sport that League could learn something from: the UFC. The Ultimate Fighter is a reality show that shows professional MMA fighters living together and training together as they compete. The ultimate prize is a contract with the UFC. UFC fighters coach the candidates, preparing them for the ultimate fight (and they stand to benefit as well, if their fighters succeed, with benefits like title shots). Ultimate Fighter is a total blast to watch, and a great reality TV program, but it has also been a crucial part of bringing the UFC into the mainstream and introducing it as a “real” sport to people who might otherwise be uninterested or believe the stigma of the UFC as a bloodsport. Ultimate Fighter winners and contestants have gone on to successful careers within the UFC, and viewers get an inside look at what it takes to be part of this field. It’s a win-win proposition. Now, let’s imagine that we applied this to the comparatively zany, but equally competitive world of League of Legends. The standard competitive league formatting is wearing thin. Why not shake things up? Esports is, by its very nature, a little ridiculous. There are countless stories from the rich history of League of Legends’ professional scene: a player getting scurvy, fights in gaming houses, epic rivalries, a player screaming Rick Fox’s name upon entering a lobby in Korea, and more. As much as League tries to appear like a profoundly adult competition, it’s hard to escape a history that is partially defined by players like Dyrus, his pillow, and Imaqtpie. This isn’t a knock on them; esports’ bizarre and ridiculous history is part of what makes it so fascinating to follow. A reality show that follows up and coming young pros could do well to embrace this and build into it. Over 1,700,000 people have watched a video of Rampage Jackson destroying a door on the Ultimate Fighter. Imagine what the esports equivalent might be? There’s also the fact that League has an abundance of various ways to watch the game. Collegiate, challenger, LCS, foreign leagues... there are a thousand ways to watch competitive League of Legends, but a reality show based around finding and training talent could afford the ability to be more light-hearted. The standard competitive league formatting is wearing thin. Why not shake things up? One of the reasons I advocate for a reality show format is because it’s fun to watch, but there’s also very real value in showcasing young talent. There are very few competitors who stick around and play for years: a player who is in their mid-20s is considered relatively quite old in League. Many players suffer wrist or hand issues after years of playing, and others find that they are interested in pursuing a romance or raising a family. A pro has a short shelf life, and it eventually becomes time to replace them. Each region, in order to be competitively viable, needs a pool of young talent they can pull from when the old guard eventually reaches the end of their careers. EU, as a region, recently suffered from this during the most recent split. When North America imported European talent, EU struggled to fill that void. Some of these players, like Origen’s brief ADC Toaster, were thrown immediately into the deep end. While the Challenger circuit is meant to be a way to build local talent, the scene has major issues that have yet to be resolved. 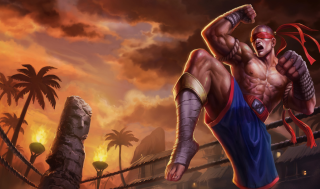 Scouting Grounds has an amazing formula, but Riot didn’t take it far enough. The Scouting Grounds was meant to be an answer to some of the above issues. Four teams, made up of unknown talent, went head-to-head in a tournament. Each team was supported by a LCS team, and pros got to try out their coaching skills. Members of the media were embedded in Mountain, Cloud, Infernal, and Ocean, and the games and results were livetweeted. This was all in good fun, and it seems to have been a valuable experience for everyone involved—but it was also frustratingly opaque for anyone who wasn’t on the grounds as the experiment unfolded. While the VODs are all available after the fact, it’s hard to tell how many people are aware that they could watch along. The highest viewed video in the playlist sits at just above 20,000 and the rest of the games are around 2,000 views. Even the first result for “Riot Games Scouting Grounds” leads to a broken page. Oops, indeed. The Ultimate Fighter is a show that is, on the surface, a fun pastime. Beyond that, it’s also had a massive impact the industry. It may not seem like a natural source of inspiration for esports, but Riot should consider the reach that the show has had. It’s a runaway success that’s wildly entertaining to watch and has helped advance UFC’s mainstream success. Scouting Grounds has an amazing formula, but Riot didn’t take it far enough. It’s time for a Scouting Grounds reality show that follows in the footsteps of Ultimate Fighter and finds similar success in advancing esports. Riot, please.